IGV Desktop supports browsing of reads from the Google Genomics Reads API and also from BAM files in Google Cloud Storage. It implements an OAuth flow to facilitate access to private data in addition to public data. Change preferences so that the Google menu is displayed. 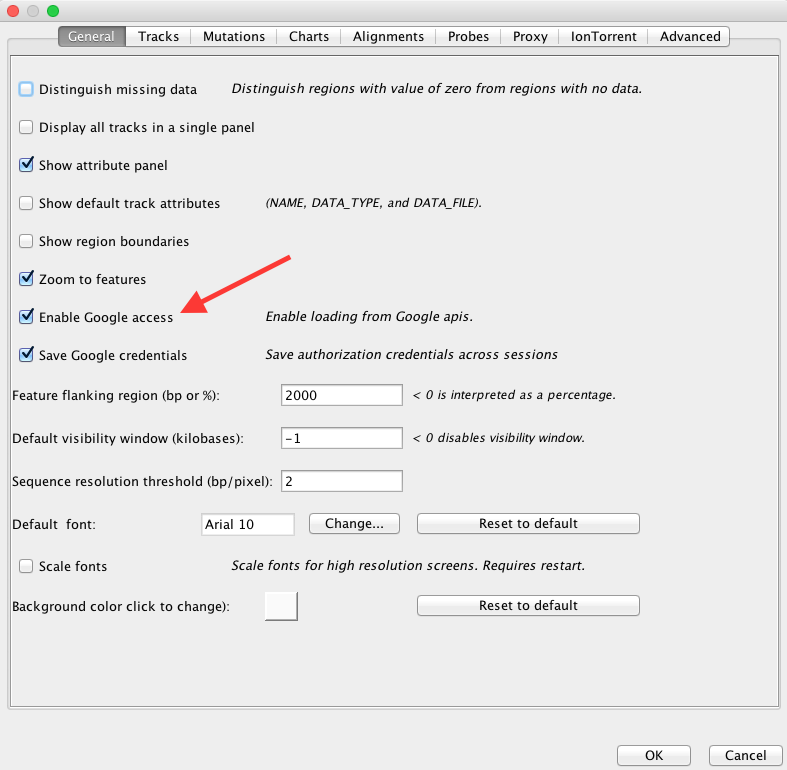 Choose menu item View -> Preferences and check the box next to Enable Google access . Log into Google. Choose menu item Google -> Login … and follow the OAuth prompts. Choose menu item Google -> Load Genomics ReadGroupSet and enter the readGroupSet ID for the readGroupSet you wish to view. For example, a readGroupSet ID of CMvnhpKTFhD3he72j4KZuyc will display the reads for NA12877 from Illumina Platinum Genomes. Choose menu item File -> Load from URL and enter the Google Cloud Storage path for the BAM you wish to view. For example, a path of gs://genomics-public-data/platinum-genomes/bam/NA12877_S1.bam will display the reads for NA12877 from Illumina Platinum Genomes. Be sure to have a .bai file stored along side the .bam file you wish to view. © Copyright 2015, Google Inc. Revision 4afd9d5a.